Uruguay with its capital Montevideo is located in South America (Southern South America, bordering the South Atlantic Ocean). It covers some 176,216 square kilometers (about the size of Virginia and West Virginia combined) with a population of 3,360,150. Spanish is the official language spoken by people in Uruguay. As an interesting fact, is sharing borders with Argentina and Brazil. Uruguay is a country in South America. It has a South Atlantic Ocean coastline and lies between Argentina to the west and Brazil to the north. One of the best experiences to have while your stay at Uruguay is to watch a game between Nacional and Peñarol, the two most followed football teams in the nation. Sunbathing, surfing and bathing in the oceanic coast. The most important beaches are Punta del Este, Piriapolis, La Paloma, La Pedrera, Cabo Polonio, Punta del Diablo and Santa Teresa(national park and camping). To reach someone Uruguay dial +598 prior to a number. The local cellular networks are operated on 850 MHz, 900 MHz, 1800 MHz, 1900 MHz, 3G, 4G. Websites typically end with the top level domain ".uy". If you want to bring electric appliances (e.g. battery chaarger), keep in min the local 220 V - 50 Hz (plugs: C, F, L). The sign for the locally used currency Peso is UYU. 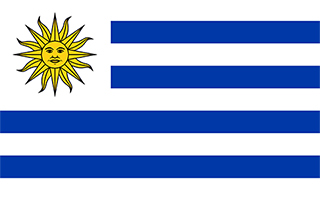 Nine equal horizontal stripes of white (top and bottom) alternating with blue; a white square in the upper hoist-side corner with a yellow sun bearing a human face (delineated in black) known as the Sun of May with 16 rays that alternate between triangular and wavy; the stripes represent the nine original departments of Uruguay; the sun symbol evokes the legend of the sun breaking through the clouds on 25 May 1810 as independence was first declared from Spain (Uruguay subsequently won its independence from Brazil); the sun features are said to represent those of Inti, the Inca god of the sun.